Retail USA - Dress Up With Foofaraw! Welcome to the Foofaraw retail shop. The styles you see here are unique to the retail shop. They are not available to my wholesale customers, nor are the designs found in your Local Yarn Shop sold here. So keep looking for Foofaraw at your LYS, There are countless styles to discover! Each style is made in small lots of 6-10 to keep the uniqueness of Foofaraw an ongoing quality. ​Shipping on each stick is only $3.00. Tassel thread colors are red, salmon, gold and light green. Stick is a glossy black. 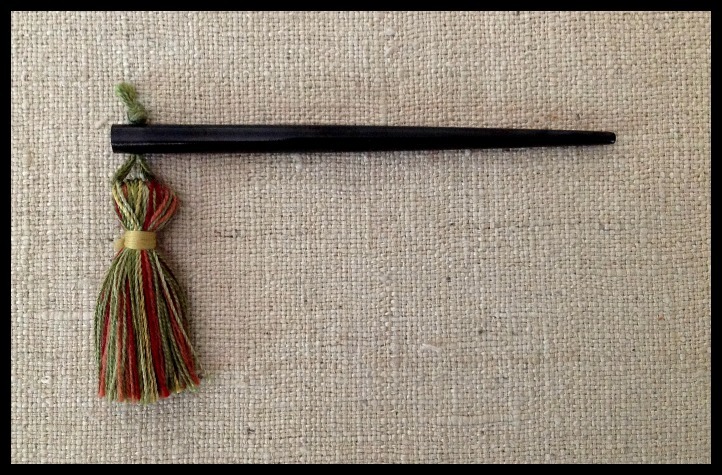 Length of tassel is 47mm. 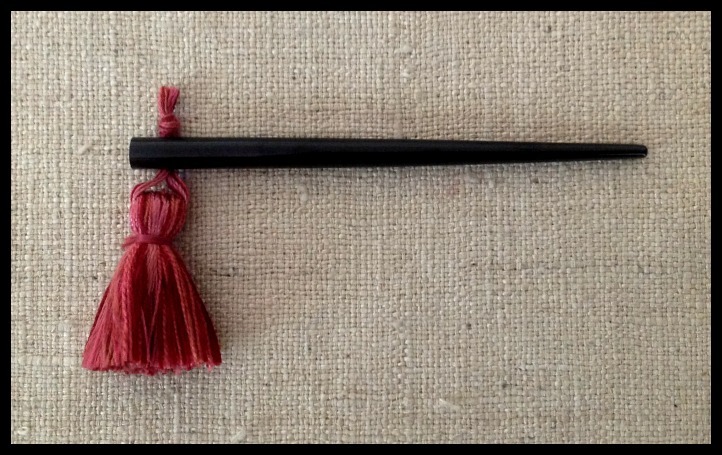 Red chenille tassel with glossy black stick. 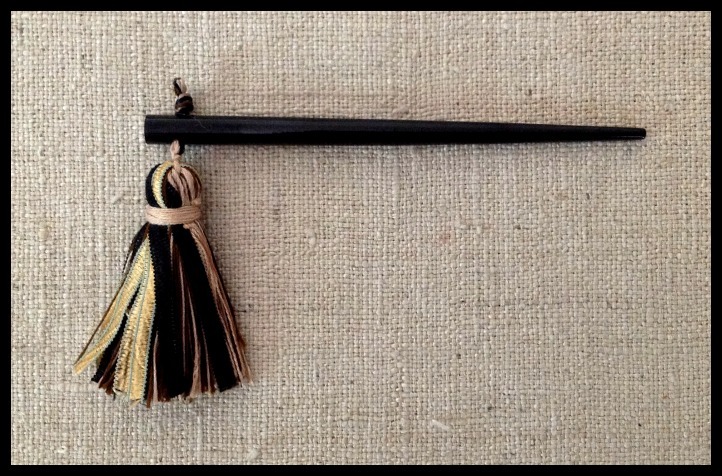 Length of tassel is 35mm. 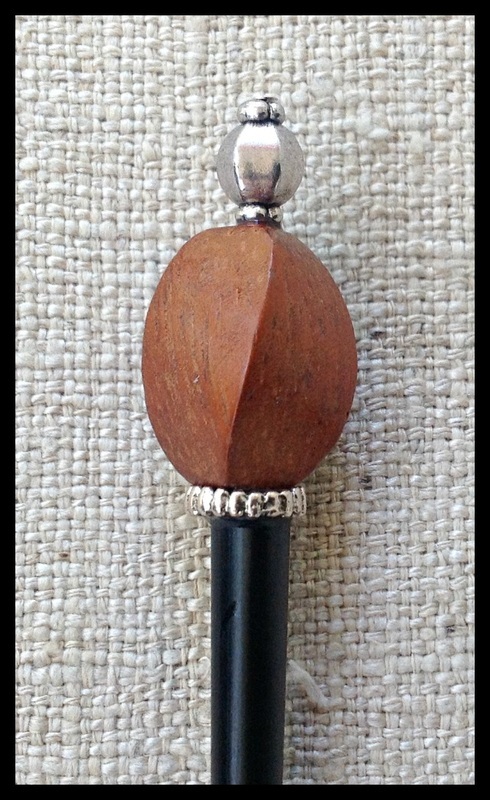 Black ribbon and thread tassel with glossy black stick. Colors include black, gold, cream and brown. Tassel length is 50mm. 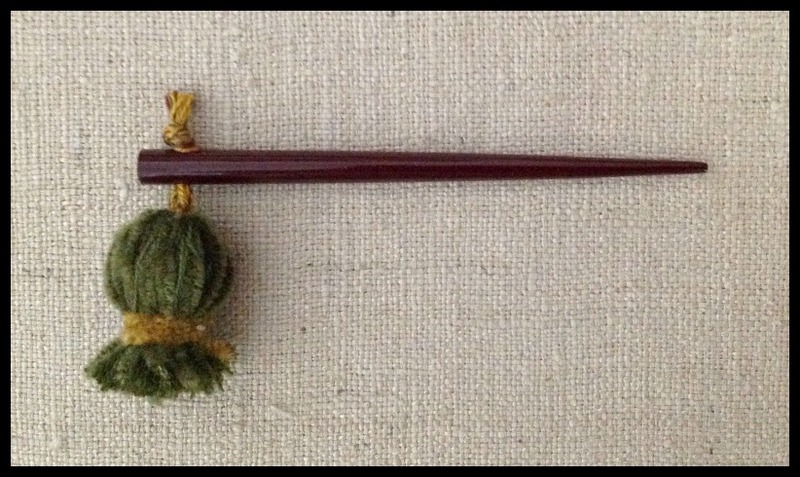 Green chenille tassel with glossy burgundy stick. Tassel length is 35mm. 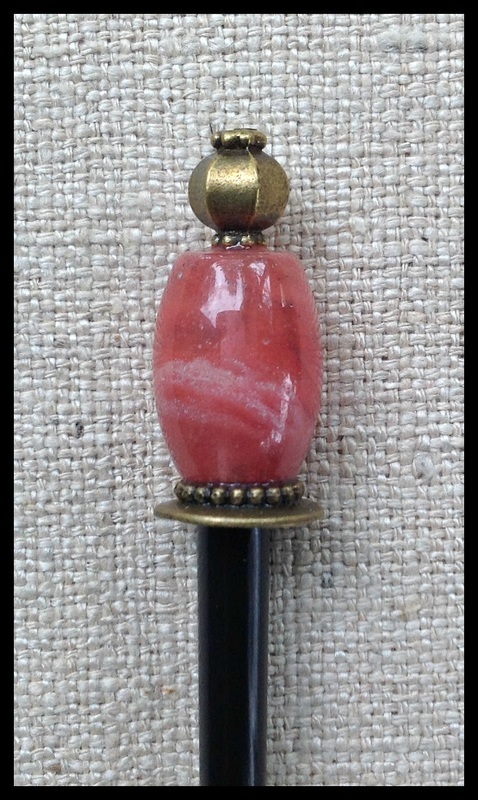 Tassel thread colors are multi shades of pink and red with glossy black stick. 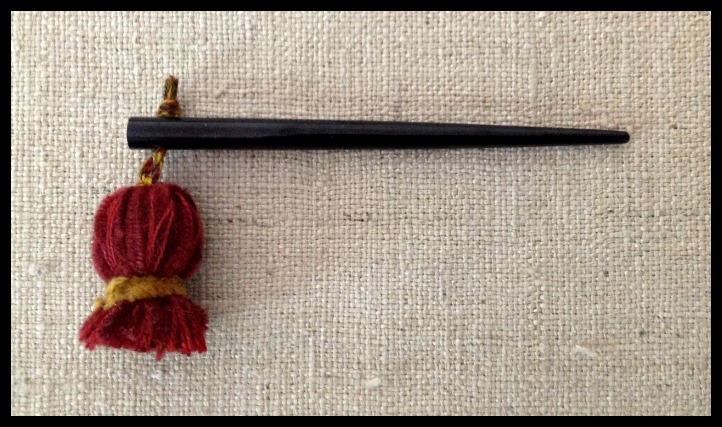 Tassel length is 37mm. 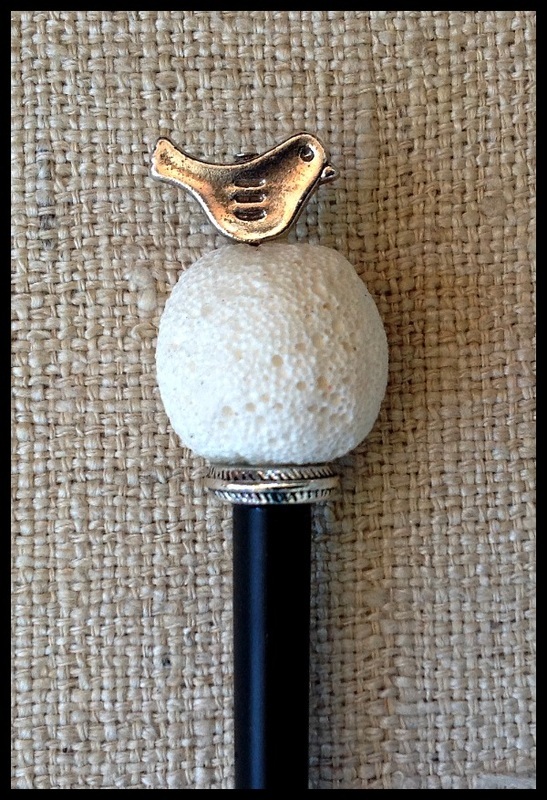 ​ White potato shaped quartz bead with silver accent beads. This shawlstick is featured in Crochet World Magazine April 2018. 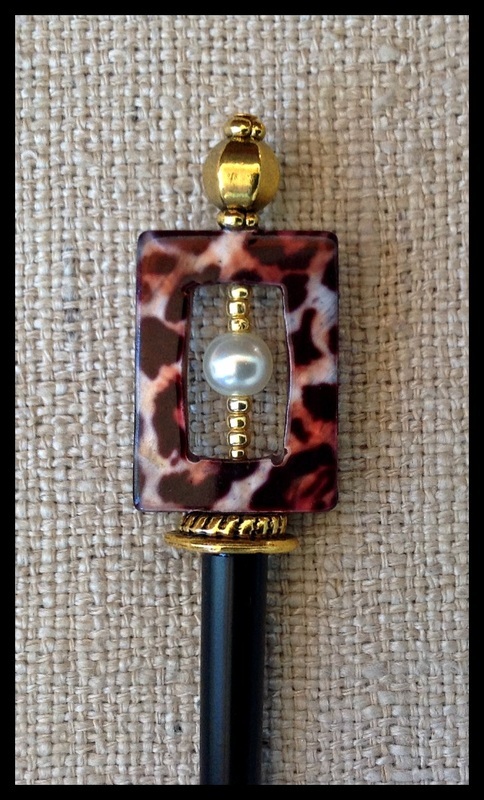 Painted shell rectangle with white shell pearl in center and gold metal accent beads. 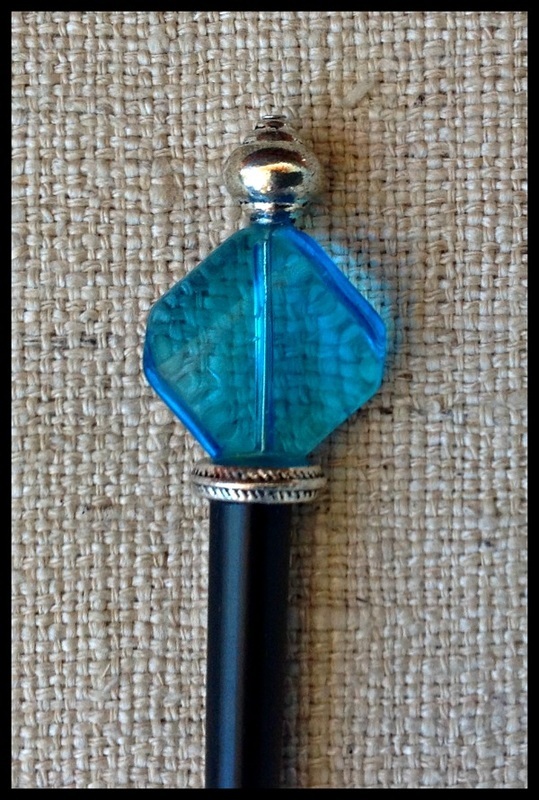 ​Blue glass twisted diamond with silver metal accent beads. Pink shell square with silver metal accent beads. 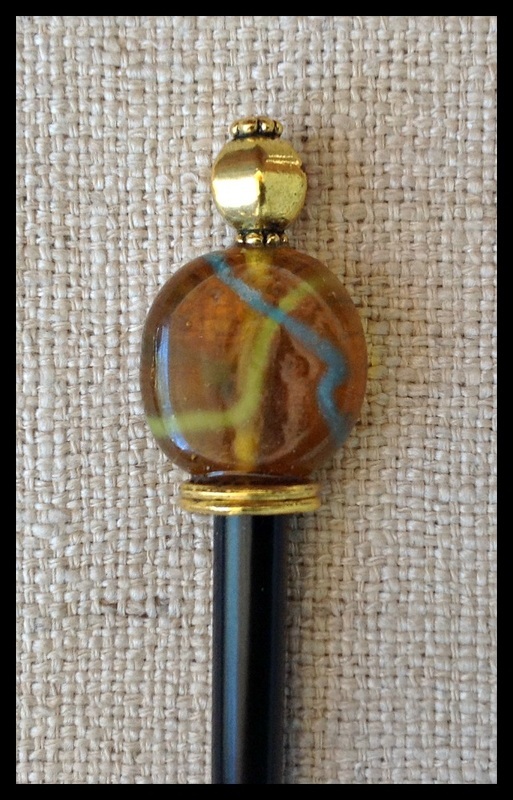 Light amber Italian glass bead with blue and lime- green random squiggles, and gold metal accent beads. ​White lava stone with silver metal accent beads. Wooden ring with green and earth tones jasper cube set on the diagonal. 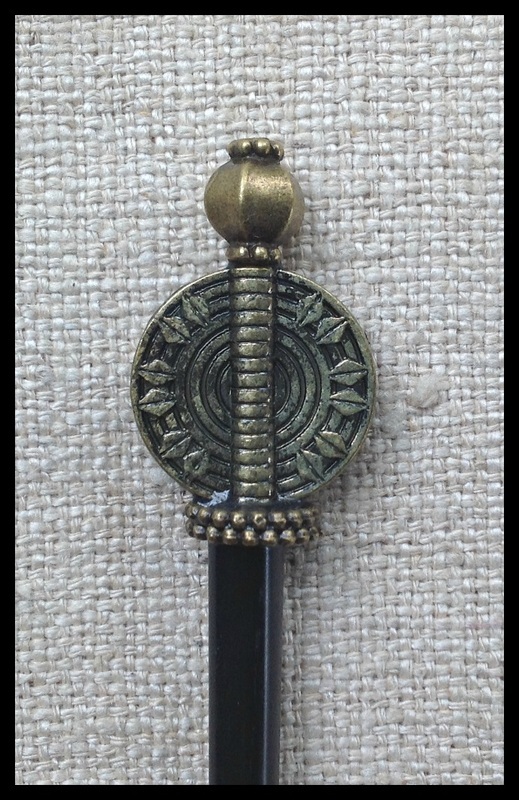 Silver metal accent beads. 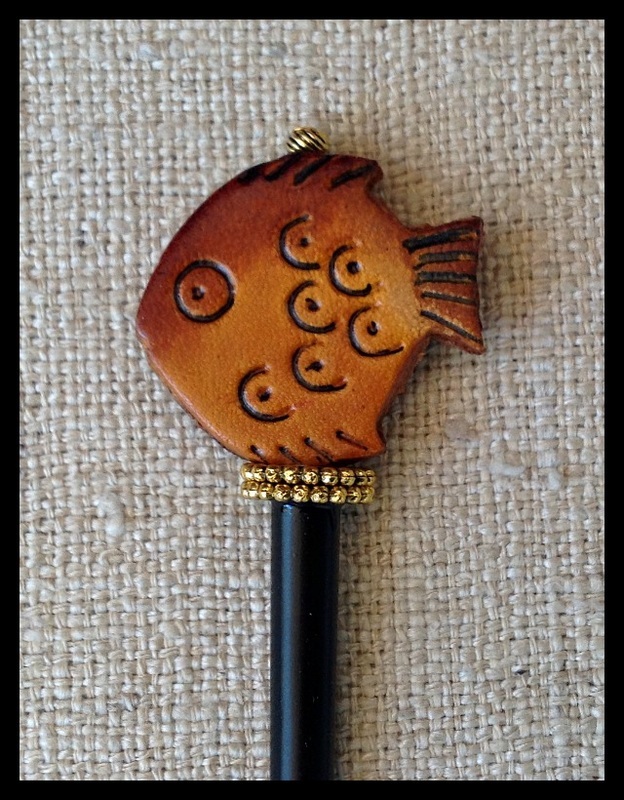 Leather fish with gold metal accent beads. 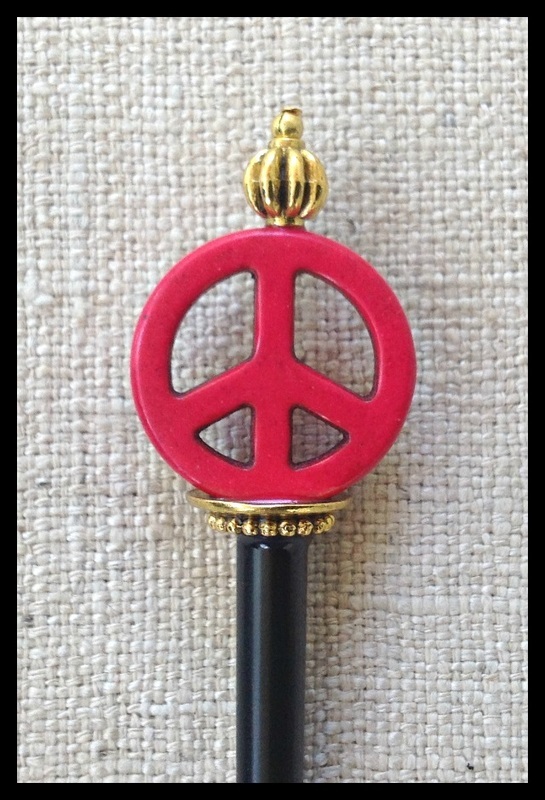 Fuschia Howlite Peace sign with gold metal accent beads. 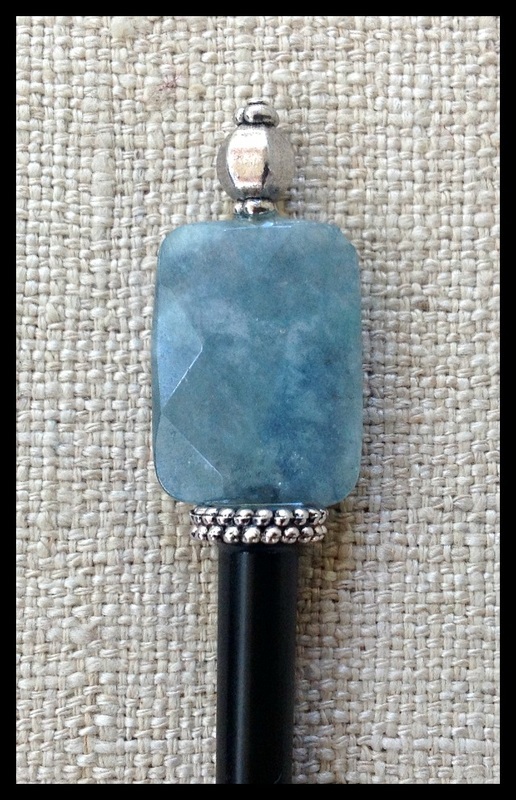 Faceted angelite rectangle with silver metal accent beads. 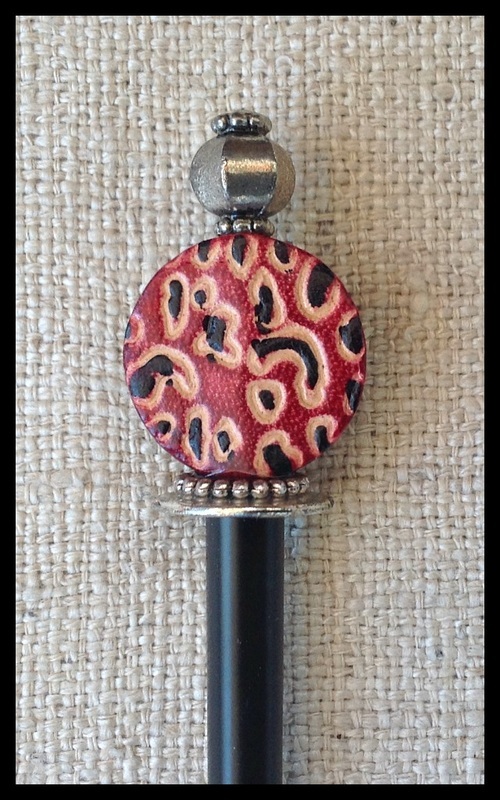 Red leather coin embossed with black and tan squiggles. Silver metal accent beads. 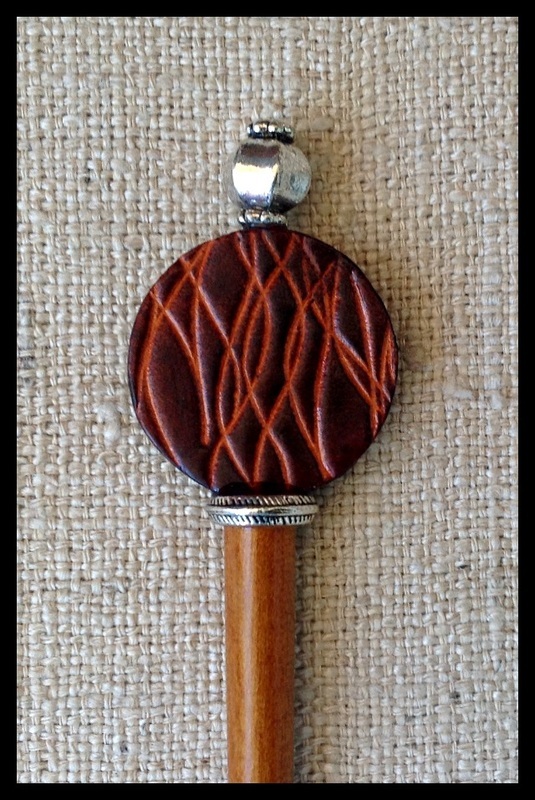 Bayong wood twist with silver metal accent beads. 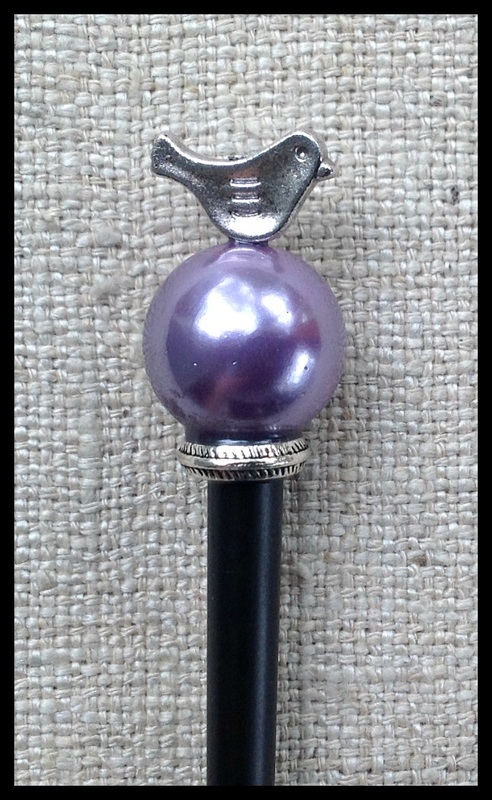 Purple shell pearl with silver metal accent beads. 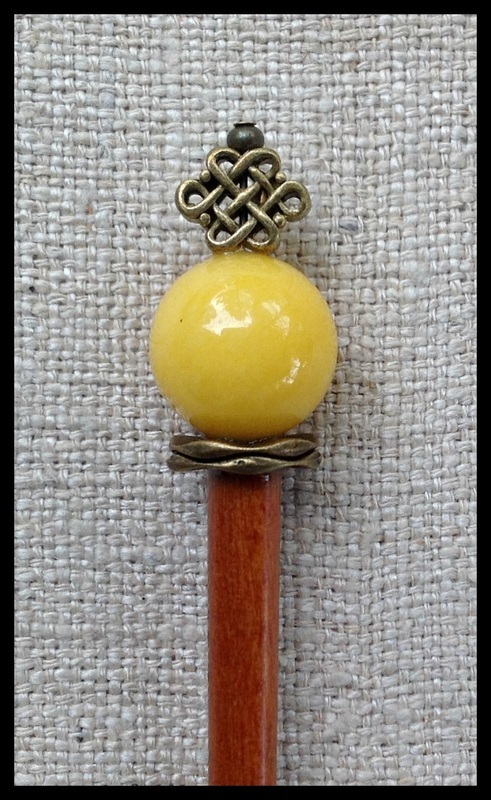 Yellow dyed Chinese jade with antique bronze metal accent beads on natural wood stick. 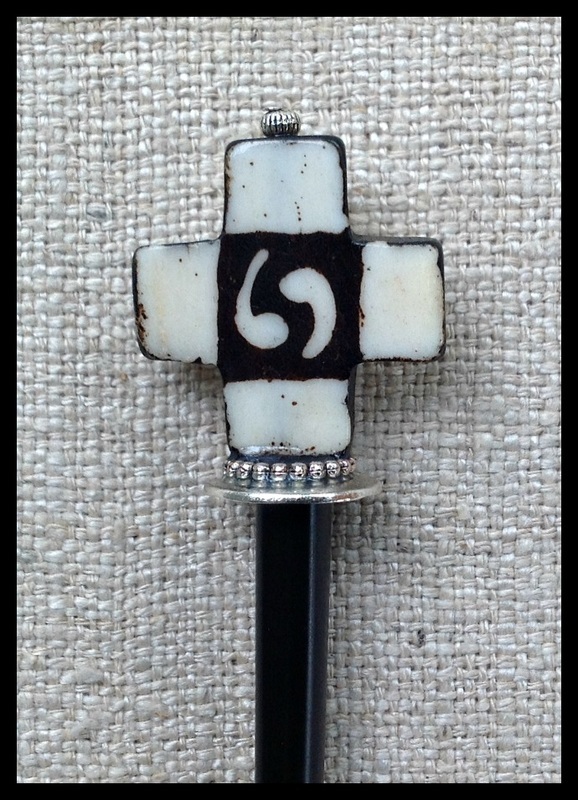 Batik bone cross with silver metal accent beads. 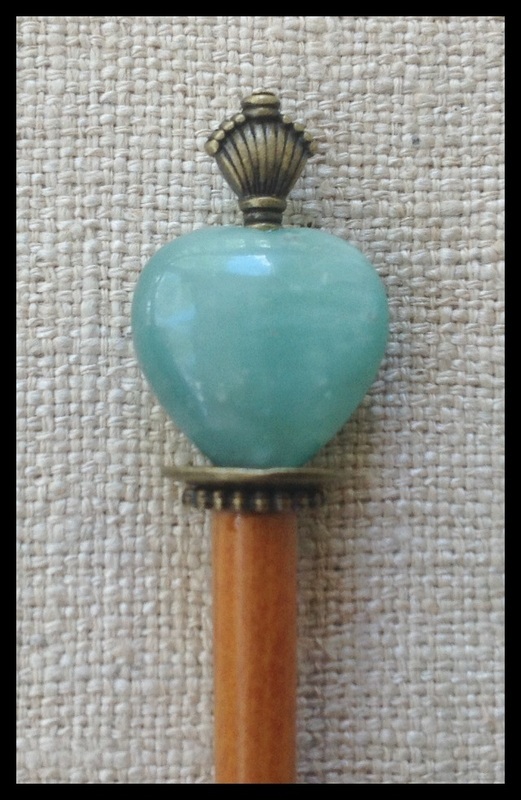 Light blue dyed Chinese jade with antique bronze metal accent beads on natural wood stick. 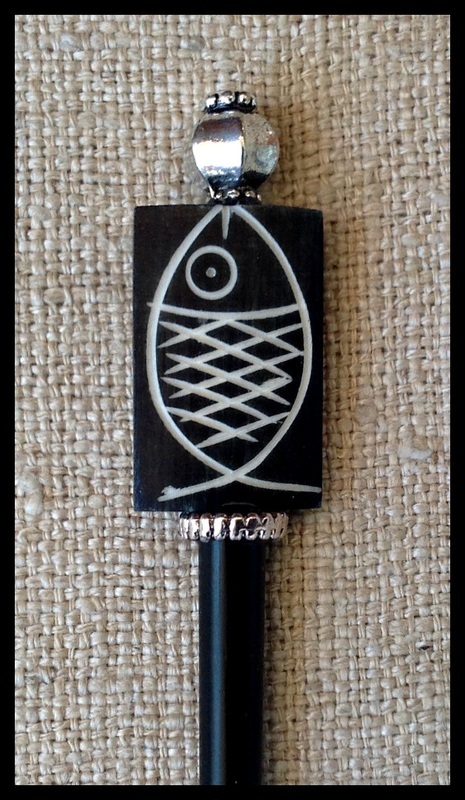 Black bone fish design with silver metal accent beads. 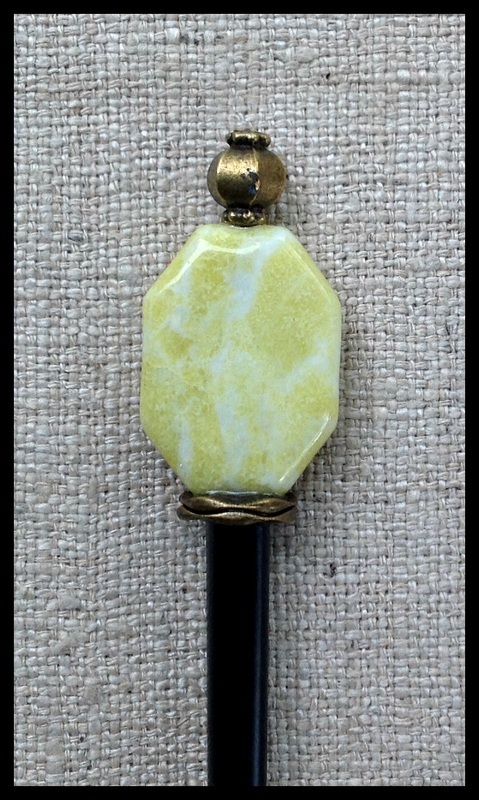 Hexagonal Lemon Stone with antique bronze metal accent beads. 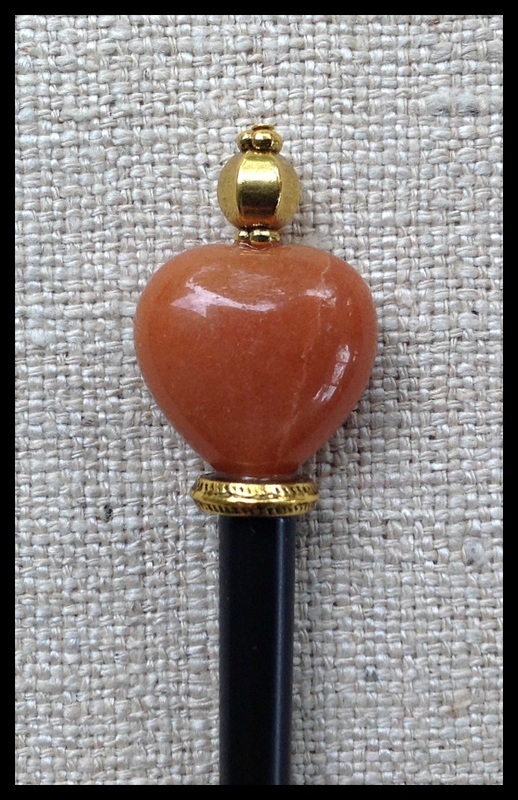 Terracotta dyed Chinese jade with gold metal accent beads. 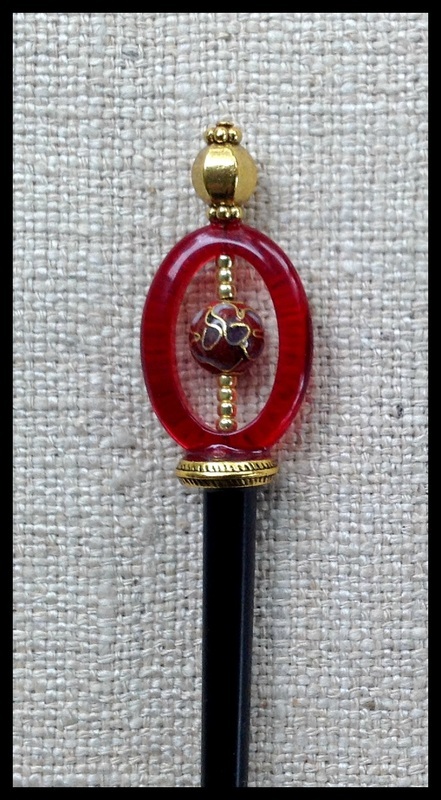 Red glass oval with cloisonne center bead. 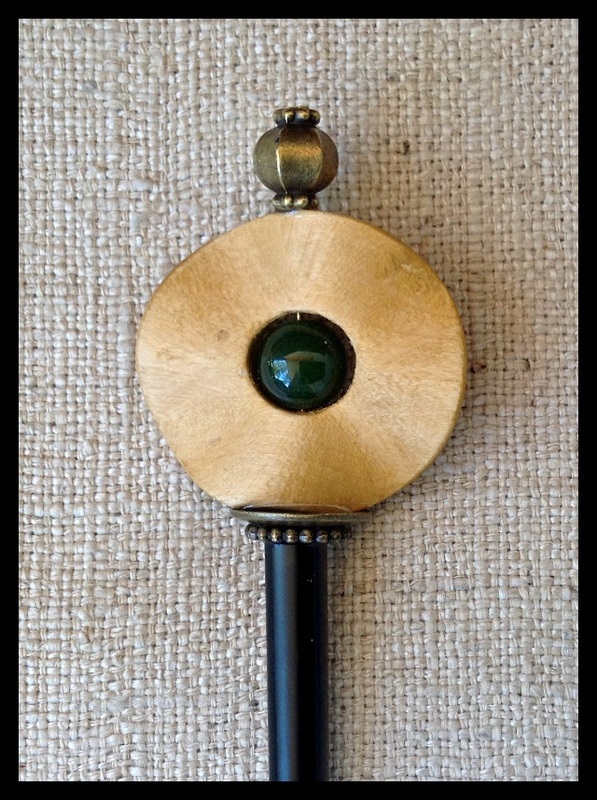 Gold metal accent beads. 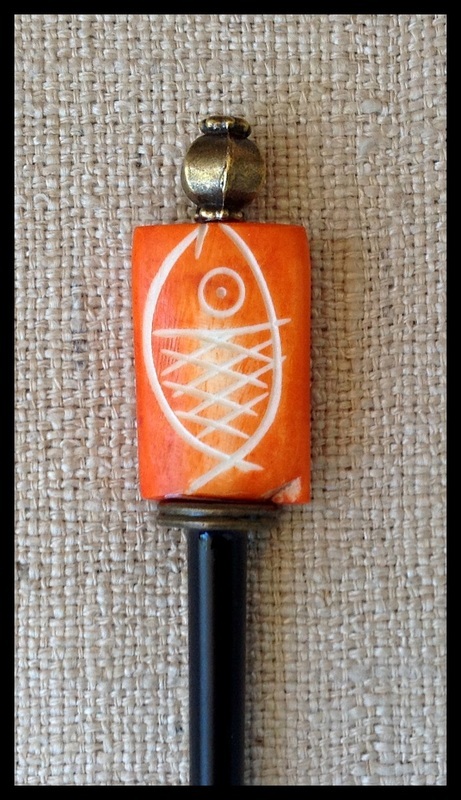 Orange bone fish design with antique bronze metal beads. Dark brown leather with tan embossed design . Silver metal accent beads. 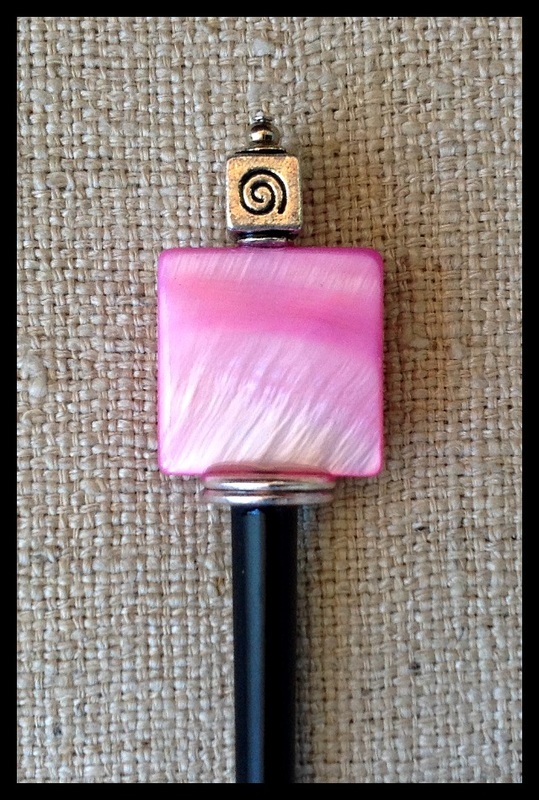 Rose quartz barrel bead with antique bronze metal accent beads. 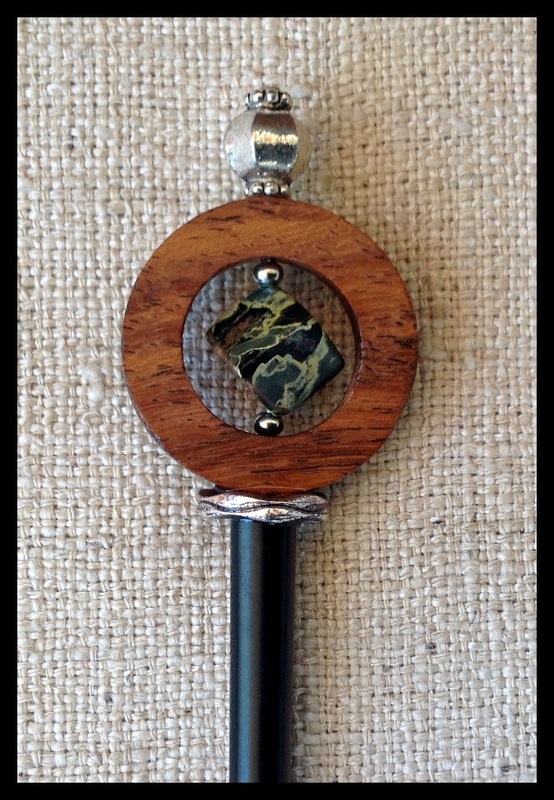 Wavy wooden ring with green jade center and antique bronze metal beads. 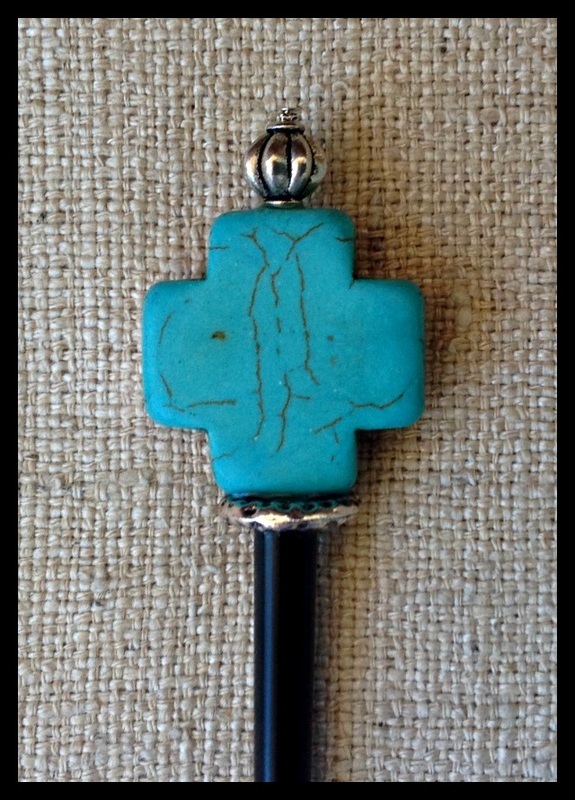 Turquoise howlite cross with silver accent beads. 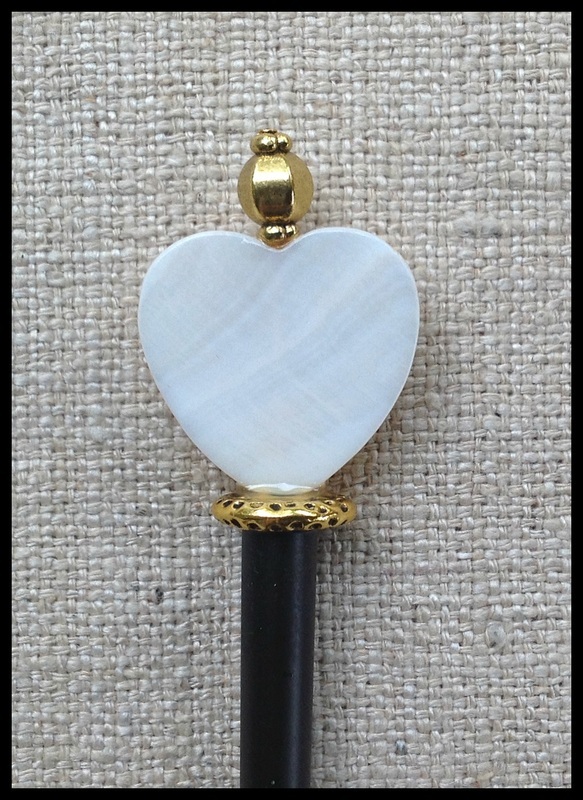 White shell heart with gold metal accent beads.